We hope you and your superheroes had a great time in this exciting journey of change. Now is the time to inspire others by your story of change. You can start the session by getting the students to share their proudest/happiest moment through each stage of the process- Feel, Imagine, and Do. Get one or two students to keep recording the reflections as students share. These points can help the students is making their narrative. A great way to start the dialogue with students is by asking them, “Why should we share? We have achieved our goal. How will my going to help anybody else?” Get responses from some students on why is sharing important. What are the different ways to share their story? Through the brainstorming, you can enable the children to come up with many creative ways of sharing their journey such as play, presentations, class to class sharing, assembly sharing, creating comics, using social media platforms, creating a storyboard etc. Record these ideas on the board as the students share as you can come back to them later. You can also show them some DFC video stories and get some responses on the bright spots from the video. In order to choose the different ways of share, go back to the list of ideas students came up with and do a quick round of voting by a show of hands for each of the idea. Once the students have chosen 2-3 ideas from the list, get the students to divide themselves in groups as per their choice. 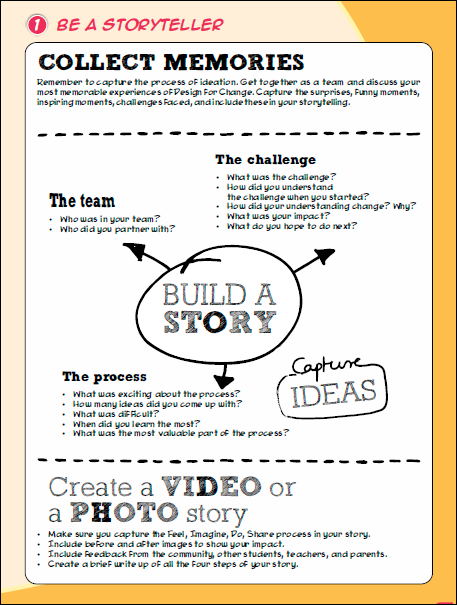 Thus, creating a photo/video story is just one way of sharing for which you can nominate a group of students who are strong in documentation and video editing. Mock ups can be a great way to get the students to prepare for the share, especially when it involves verbal forms of storytelling such as a presentation or dialogue. Who will they share with? Are there any permissions/ appointments required? Here is the link to submit the video/photo story on the submission platform. The deadline to submit your story for 2016 is October 2nd. Please make a note of your story ID as it enables us to track submission. ​The reflection/ peer review will help the students to consolidate their learnings through the share phase. A peer feedback not only enables the children to look at their growth through a different perspective, but also fosters closer bonding within the class where they start elevating each other through positive feedback. ​As you close the session, lead the students to think of various ways to use the design thinking process (FIDS) in their life. Get some students to share their responses through the think/pair/share method.